I was delighted to have Schiffer Publishing contact me to review a selection of their picture books. There can never be too many children’s books here in the Klemm household, as kiddo devours them for breakfast, elevenses, lunch, dinner, and bedtime. We’re readers. We read. We’re also artists and we love admiring quality picture books. 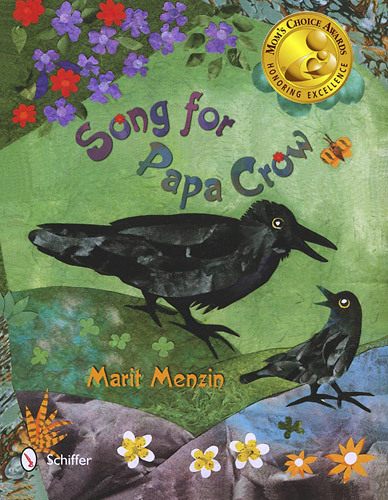 As a homeschool mom of an aspiring birder, I couldn’t find Song for Papa Crow any more perfect. This is a lovely story about how Little Crow loves to sing. He sings his heart out and in the course of teaching children what birds of North America make what sounds, we also follow Little Crow on a a journey of self-discovery and why it’s a beautiful thing to be yourself. Menzin’s collage art is gorgeous. Kiddo and I adore all the rich colors. We spend a good deal of time outdoors and it’s wonderful to see nature portrayed with so much texture even while confined to the pages of a book. Of course, after every book, I ask kiddo what she thinks. My three year old smiled broadly and responded, “I think it’s ridiculous.” Ridiculous, naturally, being pronounced ridicooooolous and said for the sheer enjoyment of using the word. Proven by the fact that she has asked for me to read “the Papa Crow one” at least twice a day since our first reading. Powerful words from a three year old, I think. She’s right, we could talk about how awesome Papa Crow is all day, but when all is said and done, Menzin’s collages simply must be seen. Songs for Papa Crow will accompany us to Story Time at Half Price Books Humble for the next two weeks (July 2nd & 9th). We meet every Wednesday, all summer, at 10:30 am. Though we typically read multiple titles, we tend to choose a favorite to feature each week. We will also have a few Schiffer Kids Spring 2014 Catalogs for patrons of Story Time to peruse. Snacks are provided. I look forward to reading more from Schiffer Books as well as Marit Menzin. The Klemms are officially fans for life.